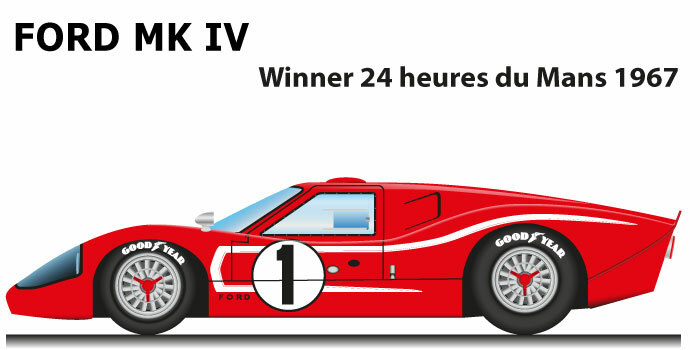 The Ford GT40 MK IV n.1 is the car winner of the 24 Hours of the Le Mans of the 1967. the manufacturer american after the victory dell’anno before with the Ford GT40 MK II, trying of repeat the success bringing in competition the new version mk iv very more light and with a aerodynamics more aggressive. The Ferrari trying of face the colossus of detroit with the Ferrari 330 P4 wherewith debuttato and won the 24 hours of daytona of the 1967. Foyt and Gurney won the 1967 Le Mans 24 Hours with the Ford GT40 MK IV No. 1, imposing a very high race pace by breaking the record of kilometers traveled in the race. Seconds with a detachment of four rounds on Ferrari 330 P4 n.21 of Scarfiotti and Parkes of the team official, while to third place the Ferrari 330 P4 n.24 of Mairesse and Blatan of the team Ecurie Nationale Belge with detachment of eleven rounds.